My dad was an amazing DIYer who understood the importance of bringing a vision to life with and for those whom he loved! He was also a perfectionist and took on every DIY project with the patience and precision of a meticulous physician (which happened to be his “day job” when he wasn’t engrossed with his power tools). Twenty years ago, he and my mom designed and built their second dream home together. 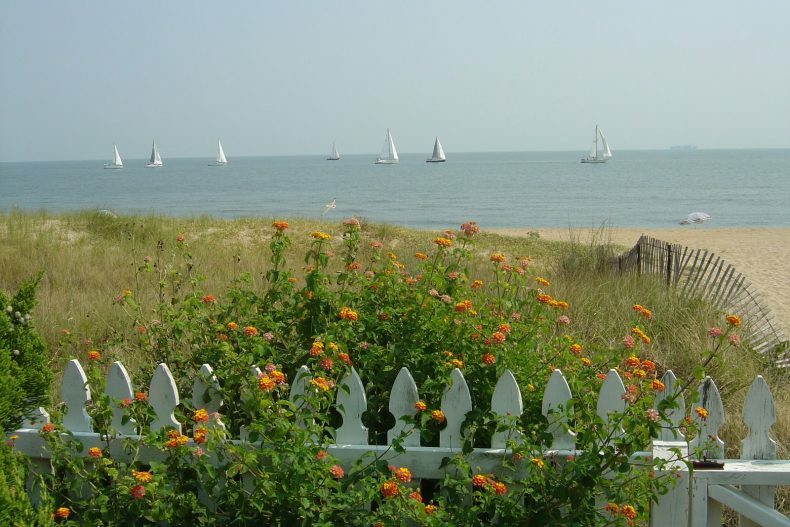 Do you see the adorable white picket fence below? That is the fence my dad lovingly crafted to fulfill my mom’s vision of a white picket fence with Colonial Gothic picket tops. My dad painstakingly built the fence, shaping each white picket by hand! 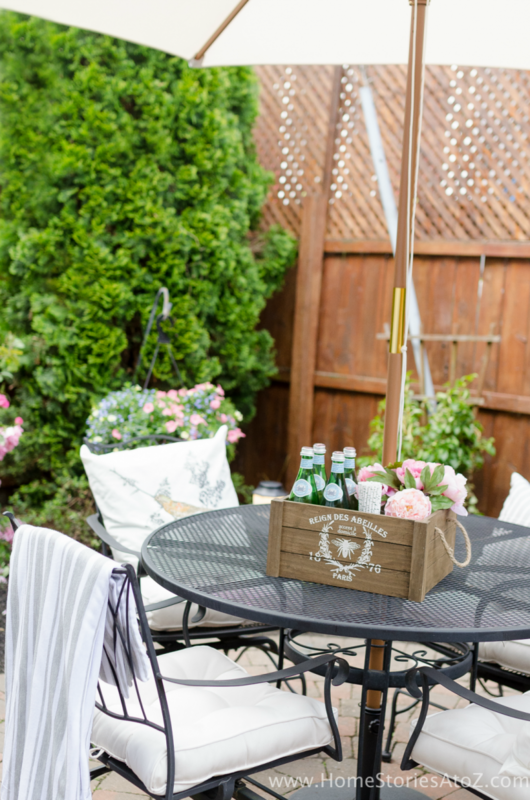 Whether he was building a fence for my mom, completing a home improvement project for himself, or crafting a pantry for his daughter, my dad tackled each DIY project with the knowledge that he was setting the groundwork for future memories to be made and shared. He passed on his love of building (and power tools!) to me and my sisters and we continue this tradition by passing our love of DIY to our kids! My husband and I have worked side-by-side on many home improvement projects over the last 17 years and it is such a blessing to create a cozy home together! Our most recent home improvement project was fixing up our back patio. We live in the city and our urban backyard desperately needed more privacy! My husband helped me extend our fence by building a few lattice panels, and I absolutely love the end result! This post is sponsored by Bosch. All opinions are my own. Granted, he may have been more motivated to get the job done because Father’s Day gifts came a little early to our home this year! 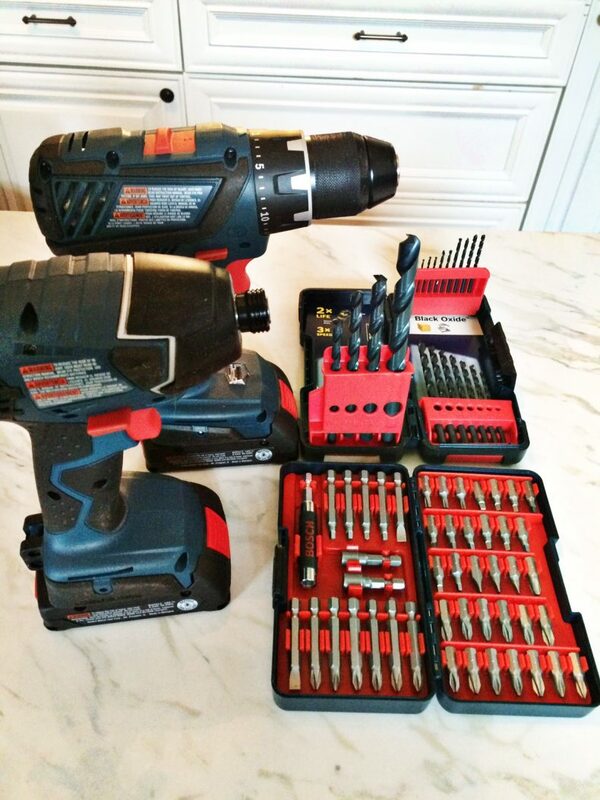 Courtesy of Bosch, I gifted my husband with the Bosch CLPK232A-181; 18V 2-Tool Kit w/ Compact Tough™ Drill Driver! This 2-Tool cordless combo kit comes with a 1/2-in drill/driver, 1/4-in hex impact driver, two 18-volt Lithium-ion batteries, charger and soft carry bag. 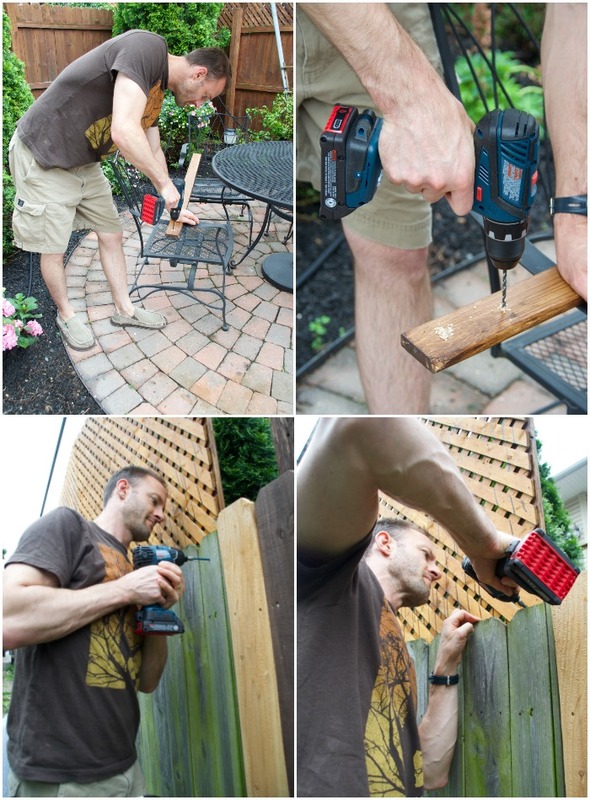 I was planning on waiting to gift the drill & driver for Father’s Day, but I just couldn’t wait to take them out of the box and start building memories (and some privacy for my backyard)! Matt predrilled holes in the support board for the lattice using the drill and then used the hex bit on the driver to secure the support board to the fence. 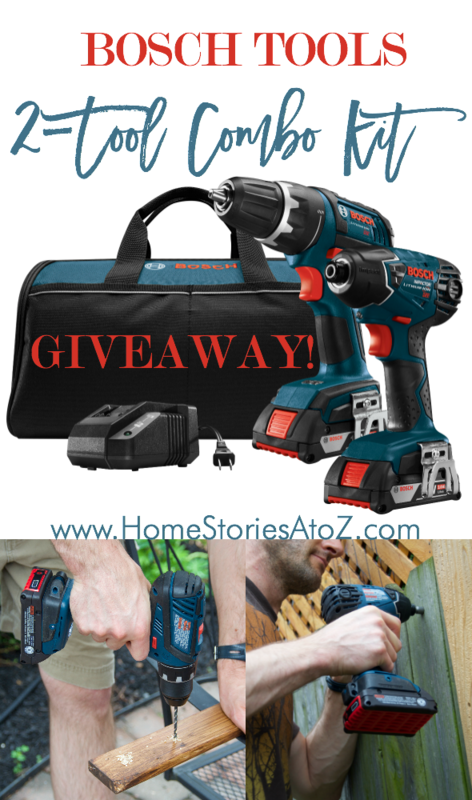 The Bosch CLPK232A-181; 18V 2-Tool Kit w/ Compact Tough™ Drill Driver is powerful, lightweight, easy to use, has excellent ergonomics, and is the perfect Father’s Day gift! It retails for $229 but is currently available at Lowe’s from now until 7/4/16 for $169. In the photo above, you can see my 11 year old’s little blonde head peeking out from behind my husband, watching how it is done. 🙂 Looking at my privacy lattice makes me smile just as much as looking at my mom’s white picket fence. Both were made out of love for family and home! I know if my dad were still alive today, he would be so proud of us and the home we have created together. Would you like to try the Bosch CLPK232A-181; 18V 2-Tool Kit w/ Compact Tough™ Drill Driver for yourself? Bosch Tools wants to give DIYers like yourself the chance to pass on the love of building to new generations this Father’s Day. Giveaway runs from 6/08/2016-6/13/2016 (12am). Follow #BoschBuildsMemories on social media! I received product and/or compensation from Bosch for this sponsored post. Be sure to connect with Bosch Power Tools on Facebook and @BoschToolsNA on Twitter. I want to build a tree house with my son. I’ll remember my dad building stuff with my kids, the deck, cabinets, etc. We are in the process of purchasing a house and my husband and I are going to build a tree house for our kids. I would love to build something with my father for my nieces and nephew…………a play set outside or even a book shelf. Our whole family built a gazebo under the supervision of my Dad. He was great! We can never have enough power tools! I had so much fun building a tree house with my dad. This would be perfect gift for my hubby. He loves to build things & fix things. I do not recall ever building anything with my father growing up, however, I participate with my husband in many home repairs and remodeling projects. My dad built the house we moved into when I was 12 years old. I remember going to the house when they were building it and helping pound into the plywood flooring. He showed me how to hit the nail on the head so you didn’t have to keep pounding it. I now love to remodel and help others with their remodeling. Sorry– I helped pound NAILS into the plywood flooring. I would love for my kids to have fun memories of building a house for our goats coming next month. Bosch tools are great. I really like the cordless drills. The kids can build that dream shed we want. I remember building a storage area around back for all of the firewood with my dad! Beautiful Home! I am sure your family are full of pride with the lovely site your father made. New Bosch tools were likely a great joy to your husband to work with you to update your current home! I am the handyman and renovator at my home. My Dad was a “DIY-er” by necessity and made our home very comfortable and modern on a very small budget. I didn’t really participate in any of the remodeling projects until I got married. In the last 50 years my husband has made each of the homes we’ve lived in very special and I’ve learned so much just assisting him. What a perfect Father’s Day gift these drills would make!! My Dad never built anything with me, but my brother-in-law helped build us a ‘clubhouse’ in our backyard when I was around 10. My husband would like to build a clubhouse for our Granddaughter. My Dad died when I was three, so I don’t have many memories of him. Think this would be a great gift for my husband to make memories, with our daughter! I guess I’m going to have to say my most favorite building memory with my dad was this past February when we worked together to build my 8 year old son a wrestling ring shaped bed ring post and ropes and all! My dad is a carpenter by trade so I’ve been building with him for as long as I can remember and I hold all those memories close to my heart and can’t wait to learn even more from him so I can spend time with my son doing cool projects like this in the future. I can think of a number of people to give this away to ! Even as a wonderful wedding present! Will enter right away!! I would like to build houses in Mexico with my kids. Lucky you building great memories and acquiring an DIY education at the same time. I would love to win the tools. Wonderful memories of building my loft for my college dorm room! One of my favorite memories with my dad was building a fence for my first home. We just bought the pickets but it was great to have him come from out of town and make our house look so much better. We built shelves for our food storage room. My dad wasn’t very handy and it took him 10 times as long to fix anything but he always finished his projects. I am grateful for his persistance and willingness to learn new skills. My dad built a shop with his brother in our backyard when was about 7-8 years old, during the summer. Every day I would hang out with them, watching and listening as daddy explained the whats and whys of the construction. I attribute my love of DIY to that summer with him. I have two very young daughters so you could say this is a work in progress. My oldest is very interested when I am doing housework and she usually has a front row seat. I love it!!! Funny how a simple picket fence can conjer up so many memories. I can just hope my two boys will remember all our “projects” with happy family times. I would love to be able to give this to my husband…I would sure make his day! I Remember Building A Deck With My Dad When I Was A Child. Great Memories! Building memories by working together to make a house a home is something to cherish forever. Your dad would be very proud of you. I love working with my son on home projects. His patience balances my impatience. To be able to do things myself would be great. No waiting for son to use his. My dad handmade both my bed and dresser and my mom put stained glass in both of them. I still have these pieces to this day! I’ll always remember the day my dad asked me to help him put a chair together. I was about 12. I realized quickly he really didn’t read directions. He’d say they didn’t make any sense, would get very frustrated and then just do it his own way. The end result was interesting to the say the least! My Dad passed away a number of years ago but his chair lives on. And every time I see that chair it makes me smile! My dad and I built built in bookcases for my house. He is always the first one to help me if I need helping doing construction on my house. Love him! I see so many projects I would like to do with my grand daughter, but we usually lack the proper tools. This would be a great help on many projects! My dad and I built a screen porch – whenever he comes over we sit in it and appreciate it! we built last year for our 18 month old grandson and 4 year old granddaughter. I watch them both while mom and dad work their jobs treasuring those wonderful memories!We are so blessed. What a great way to celebrate Father’s Day! Thanks for the opportunity to gift something special to the hard-working man in my life. This is a great Fatherr’s Day gift!!! Thank you for the chance to win memories for my family!! I would love to create building memories with our kids & want to build end tables & bedside tables for all of us together! My dad built the kids in our neighborhood a treehouse… that’s something I’ll never forget. It’s so cute to see my hubby doing things and my son right there with him! Precious! My husband has made many memories working with his daughters through the years building science projects , school projects , prom , pageant props, college storage containers and soon will be building some accessories for our first wedding! I would love to build with my children. We have 1 daughter and 2 little boys and I think maybe building a toybox or bookshelf for their room would be fantastic! I remember my dad building a playhouse for my sisters & me. It was just scrap lumber, tree limbs, & sheet metal. We danced around as he worked for us & spent so many hours playing in it. I grew up in the WV mtns with woods all around. We planted moss from the woods on the floor for carpet (there was no roof except the gorgeous trees & skies) & planted flowers along our front path. We were very poor, we didn’t even have indoor plumbing, but we were never hungry & we were very loved. 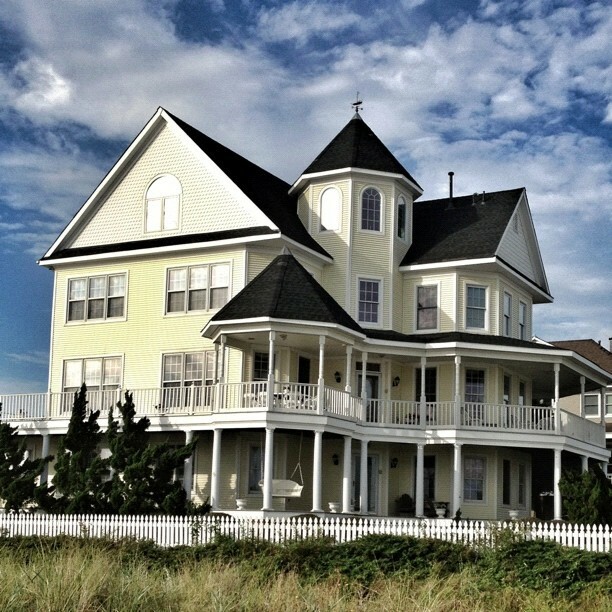 I love the big house at the beach – just gorgeous – especially the cupola! I read your blog everytime you post, so I am happy to see a contest in which I might win some tools! Thanks for sharing! We have a plot of land in New Hampshire that I’d like to build a little permanent structure on with my kids! Amazing what fun projects everyone talked about in their comments … and love how many doll houses, play houses & tree houses were mentioned. These are all great projects for women to tackle, to get comfortable working on a smaller scale while they build their carpentry skills. For me, learning how to fix the motor on my mother’s sewing machine was a lot less daunting as a kid, that trying to learn how to do anything on the car except change oil. I would love to win this for my son. He just graduated college, started his career and got married. I see a lot of tools in his future! My dad passed away last year in March. I was the one that always helped him with home projects. He was a brick mason and took me to work with him so I didn’t have to be in day care. I would love to gift my boy’s with new tools to help me now. This August I am getting married and my dad agreed to help with all my crazy DIY projects. We’re making benches for the ceremony and he’s helped me cut up some tree stumps for wood slab centerpieces. Dad’s really are the best! Great givaway! I could definitely use a set of those tools. Your parents’ home is absolutely gorgeous! 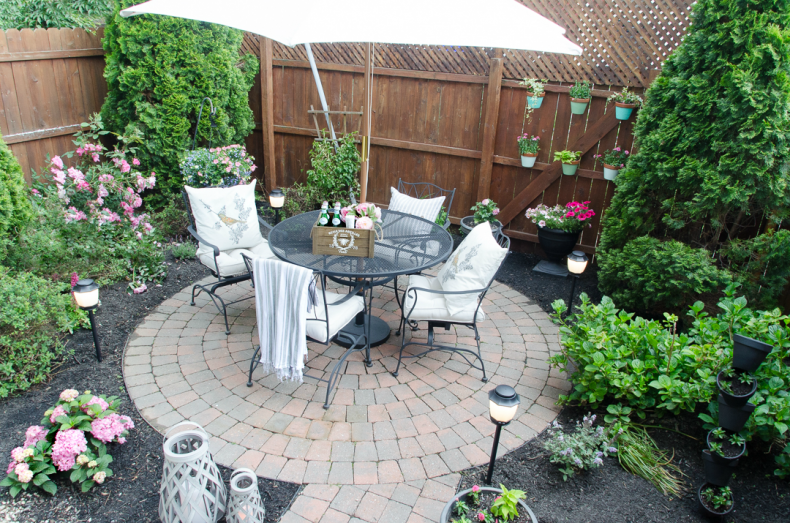 And the patio re-make you and your husband did looks lovely, too. Love the idea of the extended fence! My girls were always building something with their dad. They each wore their little apron tool belts, which carried their nails and hammers in them. Best was the look on their faces with their new projects. My dad and I remodeled a cabin together. I love working on DIY projects with my dad since he’s got all the tools and humors me with my crazy ideas! He is a self-taught DIYer and learned all his skills from taking out books from the library (long before the days of YouTube!). The latice looks great. You are lucky to have such handy men in your life. Thanks for the giveaway. We built a treehouse in the backyard. It started out as a project for my 4 brothers but they soon lost interest because it was taking so long to get it finished. Dad and I spent several days working on it and when it was finally finished, I claimed it! Thanks for the giveaway! I want to build raised beds and a coffee table for my patio. My uncle was more like a dad to me than my biological father. He taught me everything from mixing Quikrete to furniture refinishing. I remember when my dad built us a tree house when I was little. I remember restoring, sanding and staining a side table w/my Dad. The Hubs and I are real DIYers..we make seasonal wooden stands for the kids and neighbors. I would LOVE a set of tools to allow the kids to assist more w/projects. My grandfather was a wonderful craftsman. When he wasn’t patrolling the streets of Fort Worth as police officer, he built the house my Grandmother still lives in today and even built his own workshop in the back years later. He built me my first handmade anything, my rocking Lama (my sister already had the rocking horse, ha). He was always building my sister and I things, he wanted everything to be perfect my his granddaughters. I wish today, entering home ownership, that we could do projects together, but I’ll take the care and attention he passed on with me. my sons and husband love to build things together. right now they are working on adding a great room to our house. Every home I have had, my dad made sure to help me out. The time together has proved to be the best time we spend together. I have learned alot and keep teaching my kids now. One building memory I have with my dad was building a fort with us kids! Oh we had so much fun and he even helped us decorate when done. Such beautiful memories! My memory with my Dad is when he made me a dresser when I was a child, and I still have it today! Your property is jaw droppingly gorgeous! I would love to have these tools for my daughter. She is in her own home and is a big DIY type. She would adore these! I’d love to have my kids help me design and build a potter’s bench. They share my love of gardening so this would be a perfect project. Beth, your patio looks fantastic!! 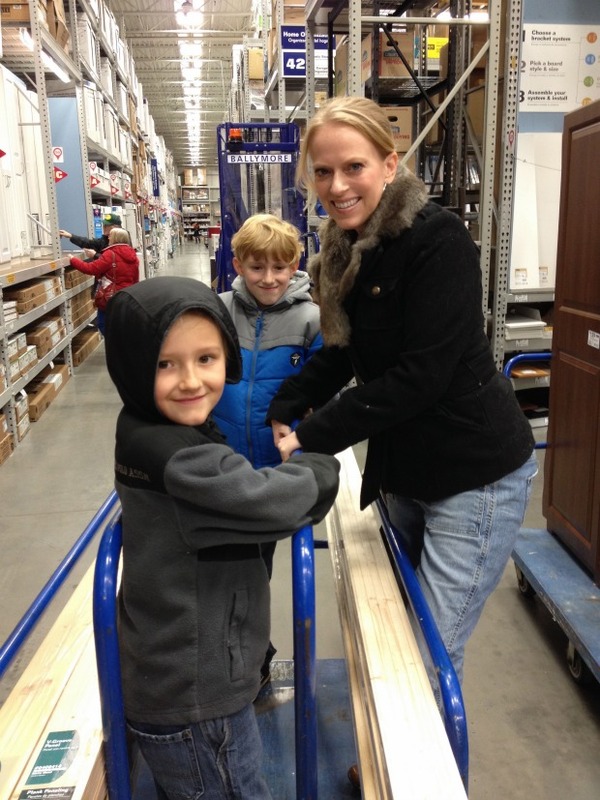 I would love to build something with my grand sons – a bird house would be a great project. I remember building a wooden rack with 3 tiers (different heights) to hold plants. I was the master-mind behind the design and my dad executed it from start to finish. God bless him. I remember my husband fixing our baby’s drawer, it was so cute :). My father was not a builder, but my maternal grandfather absolutely was, so I guess that’s where I got it. Now my husband and I enjoy building together. I’d love to win this for him. Thanks! I didn’t know that about your dad building the fence at their house. I almost cried! I love your backyard too. Matt is nice to help you in your beautiful creativity! I would love this for my hubby. His old drill just died. We built a projector screen. My love made our current kitchen table and our tv stand. My Dad and I build my first doll house together. I played with that doll house for years! It was a great bonding experience. I’d love to win this for myself. I learned to DIY alongside my dad and used those skills for the last 20 years, but my ex got custody of the bulk of our tools and I’m building up my toolkit from scratch. Thanks for the opportunity!